The ability to create a ternary plot with descending axes in available in Grapher v15 and newer. By default, the X axis is on bottom increasing from left to right, the Y axis is on the right side increasing from bottom to top, and the Z axis is on the left side increasing from top to bottom. 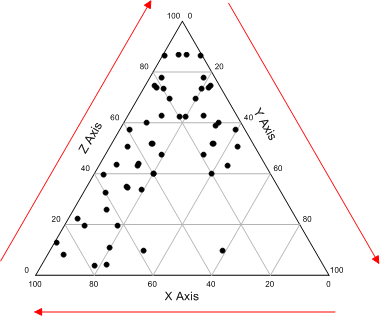 This ternary diagram depicts the default axes settings. Click the Home | New Graph | Ternary | <ternary plot type> command. 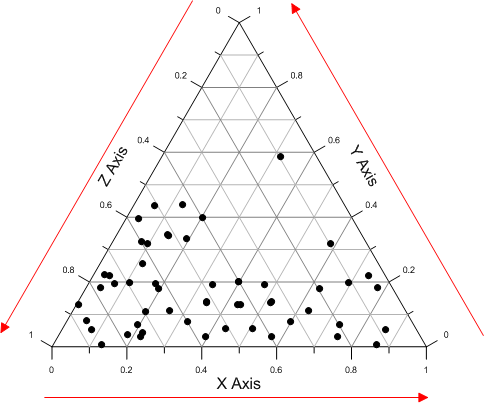 The ternary plot is created. The X axis is on bottom increasing from left to right. The Y axis is on the right side increasing from bottom to top. The Z axis is on the left side increasing from top to bottom. Click the one of the axes to select it. In the Property Manager, click the Axis tab. Check the box next to Reverse direction in the Limits section. The direction of all axes will now be reversed. The Reverse direction property is available from the Axis page in the Property Manager for all ternary axes, and applies to all axes in the plot. Click on the Ternary Plot layer in the Object Manager to select it. Change the X variable to the Y data column. Change the Y variable to the Z data column. 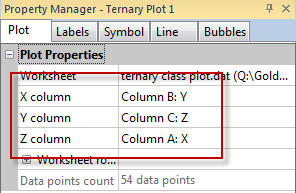 Change the Z variable to the X data column. Set the columns to rotate the variables. Click on the X Axis in the Object Manager. In the General section, change the Label source to From worksheet. The data and labels columns have the same values, but reversed. Set the Data column to the column in the worksheet that has the data values where tick marks should appear. This can be 0, 20, 40, 60, 80, 100, for instance. Set the Label column to the column in the worksheet that has the label values. These are backwards from the data column. So, this could have 100, 80, 60, 40, 20, 0. Repeat steps 10-14 for the Y Axis and the Z Axis. The labels are now reversed and the data appears to be descending. The data is reversed and the labels indicate the opposite direction. The attached GRF and XLS file show an example of this. Can Grapher create a graph from rows of data?